Backups are as integral to a business as insurance. It’s a necessary safeguard against countless security threats lurking in the global technology sphere, from hackers to ransomware to unexpected but disastrous errors. It’s not a matter of if your data is going to be threatened, it’s a matter of when. A study by IBM showed that the average cost of data breach incidents increased from $6.53 million in 2015 to $7.01 million in 2016. According to studies by FEMA and SBA, 25%-45% of businesses don’t reopen after a disaster. Backup isn’t effective unless there are three copies of your information, two on-site and one off-location. iTology uses image-based backups in conjunction with file and folder-based backups to ensure infallible defenses. While you’re doing research for IT security companies, make sure to ask if they have been able to protect each morsel of information for their clients. Many of our competitors can’t say that they have. iTology’s clients have never lost data while they’ve been with us. Through our security and data backup practices, we have succeeded in helping clients hold tightly to their data through any circumstance. Technology is the backbone of your business, and data is the backbone of technology. Don’t neglect to protect the core of your company against intruders. Work with iTology to secure your business data today. The Internet is becoming more and more integral to everyday business, but how do you choose which services are right for you? 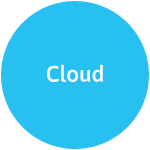 Everyone is tossing around the term “cloud” with little to no understanding of what that means. Cloud Services are actually super easy to explain. Think of your on-premise server solution and the purpose of that server. Now move all or part of what your particular server does (the on-site server solution), to a different server not at your office. Often moving services to the cloud, means less overhead and greater savings. Your technology can become more powerful and more affordable at the same time! We know how to help you make those important evaluations! Here at iTology we have adopted cloud services with open arms. We are confident that we can evaluate your I.T. environment to determine if some or all of your I.T. services would benefit by locating to the “cloud.” The team at iTology researches and tests the systems and products that are available to help you make the best decisions. Our team is dedicated to guiding you towards the best and most cost-effective solutions in the ever-changing business landscape, to keep both your downtime and costs down. We take the time needed to figure out what will work for you, so you are free to do the important work of keeping your business running and profitable! We use services like Amazon Web Services (AWS) and Microsoft Azure Services, as well as other local data center services, to create the most cost effective, robust and reliable technology solutions for your business. When built on a poor foundation, no computer system can work effectively to keep your business running! When built on a poor foundation, no computer system can work effectively to keep your business running! The backbone of your computer system is your network. iTology provides installation and support for every aspect of your technology environment, from running cabling to setting up a business-class WiFi network, to keeping your devices connected and your data moving. As we rely more and more on Internet and Cloud-based systems, fewer things will hurt your productivity as much as a network that constantly loses connection. The network engineers at iTology will help find inefficiencies in your network, as well as monitor your systems for ways to optimize your work flow and make your employees frustrations turn into productivity. Whether it’s a spotty WiFi connection, servers that never can seem to stay online, or even regular internet disruptions, iTology will do what it takes to make sure you don’t have downtime that affects your bottom line! iTology Offers a Comprehensive Security Service to Ensure What is On Your Computer and Network Isn’t Available to Prying Eyes. Do you know where your data is right now? As businesses become more reliant on the Internet, it’s important to know the data that keeps you competitive isn’t being shared without your knowledge. iTology offers a comprehensive security service to ensure what is on your computer isn’t available to prying eyes. Many companies will offer you antivirus and tell you your computers are secure. Our iTologists provide a more comprehensive and secure approach, offering not only antivirus, but malware protection, network intrusion monitoring, enterprise-grade password policies and two-factor authentications to ensure your networks are secure and only working for you! Often, businesses are under the impression their networks are being monitored because of vague implications by tech companies, when the companies aren’t doing anything of the sort. It’s easy to get misdirected by jargon and over-complicated statements. We’ll keep it simple for you: iTology inexhaustibly monitors your network to ensure constant security. We will diligently stay present to guard your network, working in the background, protecting your services so you can focus on daily operations while we keep prying eyes away from your hard-earned data. We will also work with your employees to teach them the best ways to protect your company and how to implement the newest industry standard security policies. We know the protection of your data is priority one, and the importance of its safety cannot be overstated! By being a client of iTology, you automatically get access to our security expertise at no additional cost. It’s an all-inclusive service powered by our business agreement, which dictates aligned interest between us and our clients. When your networks are thriving, we are too. We’ll diligently keep working in the background while you work on the parts of your company that you care most about.